I am surprised to see that this is the first time we have features the wonderful national flower of Costa Rica. 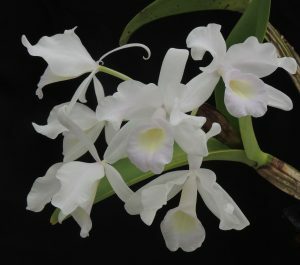 In Costa Rica the species is known as guaria morada and when DNA evidence suggested that it should be moved from the genus Cattleya a new genus was created that reflected the Costa Rican name. (This was thanks to US botanist Bob Dressler who I have had the pleasure or working with in Costa Rica). Anyway, the species is is fantastic which ever name especially in this lovely almost white clone (the usual colour is predominantly pink). I have seen the species growing in Costa Rica at around 800m on the tops of thick branches in very exposed positions in strong sunshine. We replicate these conditions by growing plants in baskets hung high in Warm Americas where they get lots of light and dry out between waterings although plants enjoy lots of water when in growth in the summer months.